Should medical marijuana be tested in Arizona? PHOENIX, AZ — Nine years after medical marijuana became legal in Arizona, the industry has yet to set any standards that would require testing of what is considered "medicine" to so many. Arizona State Senator Sonny Borrelli has been leading the fight to require this testing for several years now. Even though most of the bills he has sponsored have failed, he remains a passionate and outspoken voice for medical marijuana patients in the state. "This is the only industry that has this privilege of no transparency whatsoever," said Borrelli. Shawn Wagner, diagnosed with stage 4 cancer and chronic pain, is one of more than 200,000 medical marijuana card holders in Arizona. He's very particular about buying organic products and said he brought a small batch home from an undisclosed dispensary in Phoenix only to open it and find a layer of mold growing on his medicine. "I was furious. I called and then they said, 'I'm sorry this happened,'" said Wagner. Borrelli said this is unacceptable as many people who take this medicine are diagnosed with serious illnesses, and already have compromised immune systems. "Here is something they are calling a medicine, yet the patients have no idea the chemicals that are being used in the cultivation part," said Borrelli. Borrelli's latest effort to put the State Department of Agriculture in charge of overseeing the testing failed because it did not get a majority vote on the senate floor. "It's the wild west. They have no regulation whatsoever. They get to do what they want. They don't care about the patients. All they care about is the profits," said Borrelli. ABC15 took Borrelli's concerns and comments to Demitri Downing the president of MITA, the Marijuana Trade Industry Association. The group is a voice for not only patients, but also the dispensary owners, growers, investors and testing facilities in Arizona. Downing agrees medical marijuana should be tested. 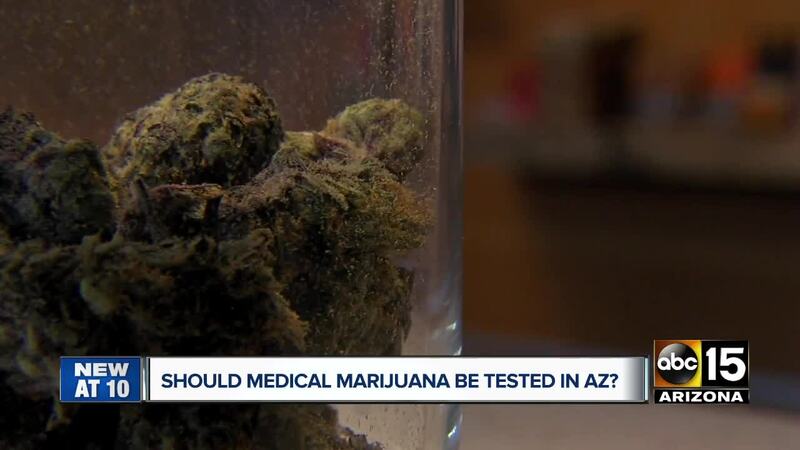 ABC15 asked Downing why every other state that had legalized medical marijuana had been able to come up with testing protocol, and what was the hold up in Arizona? "Well, it was Will Humble, the director of DHS's intent to have testing back when he designed the program in 2012-2013, but he wanted to wait until the program was evolved," said Downing. While the industry supports testing, Downing said they want to make sure they get the right bill in place. Downing said Borrelli has not been able to get all of the industry stakeholders together to support his bill, but they will be supporting a similar effort by State Senator David Gowen who is sponsoring Senate Bill 1494. A glaring difference between the two bill seems to be that Borelli's bill calls for the Department of Agriculture to be in charge of testing the product for pesticides, while the other bill kept it under the Department of Health, who is already overseeing the program. Supporters of Gowan's bill feel it would be simpler to keep it all under the same roof. ABC15 reached out to Gowan's office to discuss his bill but were told by a staffer that he was not available. Downing said even if the bill passes, the customers would be the ones who would ultimately pay the price for testing. "It all gets transferred down to the consumer the patient no matter what, so let’s not kid ourselves, it's going to cost the patients more money for their medical marijuana," said Downing. Wagner said if it means clean medicine, he doesn't mind shelling out a few extra bucks for his medical marijuana. Senate Bill 1494 could head to the floor for a full vote later this week.